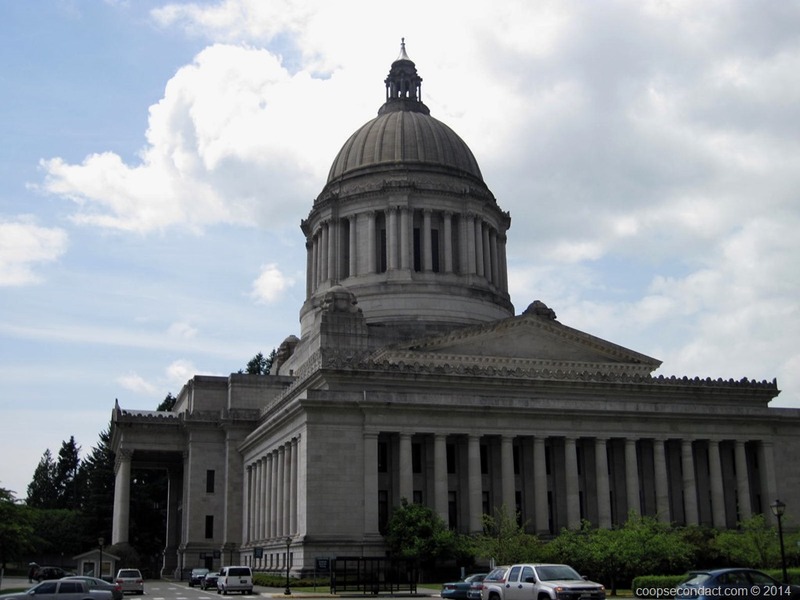 Completed in 1928, the Washington State Capitol building (pics) is situated on a knoll in Olympia, WA, overlooking Capitol Lake and the southern tip of Puget Sound. Referred to as the Legislative Building, this building is a part of a group of buildings that also includes the Temple of Justice (Supreme Court). The dominant feature of the Capitol is its dome which at 287 feet is the tallest self-supporting masonry dome in the United States and fourth tallest in the world. Number one on this list is none other than St. Peter’s Basilica in Rome. Inside, suspended by a 101-foot chain is a 10,000 pound bronze chandelier containing over 200 light bulbs. This is the largest chandelier ever created by the artists of the Tiffany Studios in New York. They like to point out that it could fit a full sized VW beetle if put in sideways.